A wave just before breaking at Manhattan Beach, California. A wave is a disturbance that propagates through space in a regular pattern, often involving the transfer of energy. When thinking about waves, a person tends to recall ocean waves or ripples on a pond. Scientists have found that sound and light (electromagnetic radiation) can also be described in terms of wave motion. Sound involves mechanical waves that propagate as vibrations through a medium, such as a solid, liquid, or gas. By contrast, light can travel through a vacuum, that is, without a medium. In addition, the movement of subatomic particles also has wavelike properties. Thus a wide range of physical phenomena can be understood in terms of wave motion. Sound waves, which are mechanical waves that propagate through air, liquids, or solids. In common usage, sound waves have frequencies that are detectable by the human ear. Scientists, however, include other similar vibratory phenomena in the general category of "sound," even when they lie outside the range of human hearing. It should be noted that although these waves travel and transfer energy from one point to another, there is little or no permanent displacement of the particles of the medium. Rather, the particles of the medium simply oscillate around fixed positions. Electromagnetic radiation, which is constituted of radio waves (including microwaves), infrared rays, visible light, ultraviolet rays, X rays, and gamma rays. The various forms of electromagnetic radiation differ in their frequencies (and wavelengths), but they share other properties. They can propagate through a vacuum, traveling at a speed of approximately three hundred thousand kilometers/second. According to the quantum mechanical model, these forms of radiation exhibit the properties of particles as well as waves. The "particles" are thought to consist of packets of energy known as photons. Moreover, Albert Einstein's theory of General Relativity predicts the existence of gravitational waves, which are fluctuations in the gravitational field. These waves, however, have yet to be observed empirically. 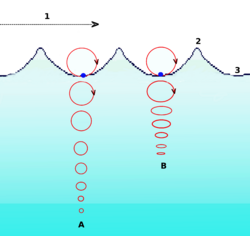 Periodic waves are characterized by crests (highs) and troughs (lows). If the waves remain in one place, such as the vibrations of a violin string, they are called standing waves. If the waves are moving, they are called traveling waves. Waves are often classified as either longitudinal or transverse. Transverse waves are those with vibrations perpendicular to the direction of propagation of the wave; examples include waves on a string and electromagnetic waves. Longitudinal waves are those with vibrations parallel to the direction of propagation of the wave. Most sound waves are longitudinal waves, where the air is both compressed and rarified in the direction of movement of the traveling wave. A = At deep water. B = At shallow water. The circular movement of a surface particle becomes elliptical with decreasing depth. Ripples on the surface of a pond are actually a combination of transverse and longitudinal waves, and the points on the surface follow orbital paths. Thus, when an object bobs up and down on ripples in a pond, it experiences an orbital trajectory. Reflection – the change of direction of waves when they hit a reflective surface. Refraction – the change of direction of waves when they enter a new medium. Interference – the superposition of two (or more) waves that contact each other, producing a new wave pattern. Diffraction – the bending, spreading, and interference of waves when they pass by an obstruction or go through a narrow gap. Dispersion – the splitting up of waves that have several components of different frequencies. Rectilinear propagation – the movement of waves in straight lines. Thus, by understanding the concept and behavior of waves, we can explain the properties of sound, electromagnetic radiation, subatomic particles, and so forth. A wave is said to be "polarized" when it oscillates in only one direction. The polarization of a transverse wave (such as light) indicates that the oscillations occur in a single plane perpendicular to the direction of travel. Longitudinal waves, such as sound waves, do not exhibit polarization, because for these waves the direction of oscillation is along the direction of travel. A wave can be polarized by using a device called a "polarizing filter." A wave can be described mathematically using a series of parameters including its amplitude, wavelength, wavenumber, period, and frequency. 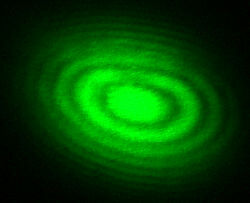 Interference pattern produced with a Michelson interferometer. Bright bands are the result of constructive interference, and the dark bands are the result of destructive interference. Consider two waves that have the same wavelength (or frequency) and amplitude , and they are superimposed on each other such that they are "in phase"—that is, the crests and troughs of one wave overlap the crests and troughs of the other, respectively. Then the resultant waveform will have an amplitude of . This is known as constructive interference. On the other hand, if the same two waves are 180° out of phase when superimposed (that is, the crests of one wave exactly overlap the troughs of the other), the resultant waveform will have an amplitude of zero. This is known as destructive interference. Constructive and destructive interference are illustrated below. A linear medium, if the amplitudes of different waves at any particular point in the medium can be added. A bounded medium, if the medium is finite in extent; otherwise, the medium is called an unbounded medium. A uniform medium, if the physical properties of the medium are the same in different parts of the medium. An isotropic medium, if the physical properties of the medium are the same in different directions. where is the amplitude envelope of the wave, is the wave number, and is the phase of the wave. It should be noted that the velocity ( ) depends on both the type of wave and the medium through which it is being transmitted. This can be viewed as two pulses travelling down a taut rope in opposite directions; F in the +x direction, and G in the -x direction. If we substitute for x above, replacing it with directions x, y, z, we then can describe a wave propagating in three dimensions. In quantum mechanics, the Schrödinger equation describes the wavelike behavior of subatomic particles. Solutions of this equation are wave functions that can be used to describe the probability density of a particle. Quantum mechanics also describes particle properties that other waves (such as light and sound) have on the atomic and subatomic scales. French, A.P. (1971). Vibrations and Waves (M.I.T. Introductory physics series). Nelson Thornes. ISBN 074874479. This page was last modified on 10 August 2013, at 16:14.